There are many benefits of coloring that can help your child’s development in more ways than you can think. For many parents, a set of coloring books and crayons is a great go-to for any rainy day or time you want your kids to stay occupied. While coloring can be a good option for keeping kids quiet, they can be extremely advantageous for their overall mental and even physical development. In order to improve handwriting, children need to build up certain strength and familiarity with holding objects like pens or pencils. A child’s first set of crayons is a great way to introduce them to writing utensils and their use. It can also help with the motor skills needed to execute good penmanship. As kids use crayons effectively to color within the lines, they are building up the dexterity needed to move a pen or pencil on paper. For many kids, making it through a coloring page takes a great deal of patience. However, doing so can help them exercise this skill in other areas of their life, too. For many kids, and now adults, calmly coloring can prove to be an effective stress reliever and provides relaxation. Linked closely with patience, coloring can help kids develop their ability to focus on a single task. The goal of finishing a picture provides them with the motivation to completely color the image. It has been proven that children who spend their time coloring have better concentration and focus skills. Coloring a picture can help your children to recognize lines, perspective, color, hue, shape and form. Visually it helps them select colors for the image and begin to see the picture as a whole even before it is completely colored. Depending on the images they are coloring, kids can also become more familiar with and better able to recognize patterns. Coloring sparks a child’s ability to make and create things. Coloring inside the lines and using the proper colors can demonstrate an understanding of the world around them. Even kids who use untraditional colors or go outside the lines are expressing themselves and unleashing their imagination in unique ways. Coloring is often a child’s first active experience with identifying and using color. It can help introduce them to different shades and hues, as well as other complexities of the color wheel. By deciding on what color to use next, kids are exercising their creative or critical thinking skills. Whether your kids are actively coloring or just talking about it, coloring will give your kids an opportunity to learn new words and sentences. Using descriptive words to convey different styles of coloring sheets or variations of color, can help with language and vocabulary development. 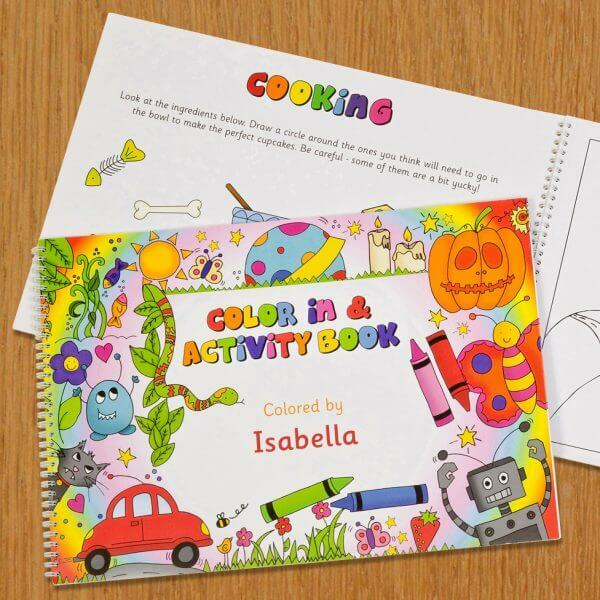 KD Novelties can take coloring a step further by providing personalized coloring and activity books. Starring the child’s name throughout these custom-made coloring books, can make coloring an even more immersive and interactive experience. Visually exciting, personalized activity books are full of funny characters, educational fun and has an emphasis on creativity. These amazingly awesome activity and coloring books are great for developing basic problem solving skills and entertaining children.